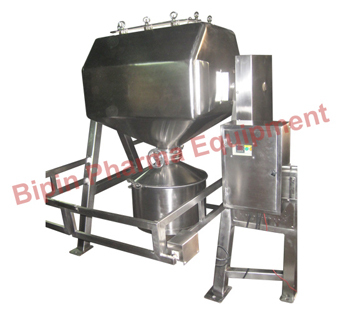 Our Octagonal Blenders are made with superior quality raw material that efficiently processes large volumes of product. Crafted to perfection, these machines are octagonal and compact in size compared to a â€˜Vâ€™ shaped or double cone blenders. Moreover, Octagonal Blenders are in high demand on the global market owing to its less power consumption, low blending speed and being well balanced even in higher capacities. &ast; All contact parts are made in stainless steel grade SS 304 or SS 316. &ast; The octagonal shape is rectangular in centre and is equipped with a conical discharge frustum and rectangular top frustum. &ast; Baffles are provided in the shell. &ast; All moving parts are enclosed within guards and a manhole with gasket is provided to fix the baffles and also to facilitate the ease of cleaning the shell. &ast; Charging and discharging takes place through a butterfly valve. A conical adapter can be provided in order to fix the charging drum after the butterfly valve. &ast; A safety railing with a limit switch is provided for safety. Manual inching arrangement for the above and flame proof motors with flame proof push buttons can be provided as per requirement. Office : Gala No. : H. No. 3073, Jabarpada, Opp. National Highway No. 8, Nalasopara (E), P.O. Pelhar, Ti. Vasai, Dist. Thane - 401208, Maharashtra, India.